to create and deploy Multilingual Knowledge Systems. Multilingual knowledge systems link knowledge (meaning) with language (words). Flat vocabularies are enriched with semantic structures. Thesauri, taxonomies are enhanced with more languages. With Coreon organizations build and explore taxonomies, ontologies, and terminology within one single system, in one view. Linguistic quality tools keep the data clean and consistent for reliable reuse in various applications. Half of big data is unstructured – Coreon turns textual, multilingual information into actionable knowledge. Benefit from intelligent big data mining. Facilitate cross-border interoperability. Master language. For decades Computer Assisted Translation based on translation memories has been the standard tool for going global. Although CAT had been originally designed with a mid-90s PC in mind and there have been proposals for changing the underlying data model, the basic architecture of CAT has been left unchanged. The dramatic advances in Neural Machine Translation (NMT) have now made the whole product category obsolete. While selling translation memory I always said, machines will only be able to translate once they understand text. And if one day machines would, MT will be a mere footnote of a totally different revolution. Turns out that neural networks stacked deeply enough do understand us sufficiently to create a well formed translation. Over the last two years NMT has progressed dramatically. It has now achieved “human parity” for important language pairs and domains. That changes everything. Most players in the $50b translation industry, service providers but also customers, think that NMT is just another source for a translation proposal. In order to preserve their established way of delivery they pitch the concept of “augmented translation”. However, if the machine translation is as good (or bad) as human translation, who would you have revise it, another translator or a subject matter expert? Yes, the expert who knows what the text is about. The workflow is thus changing to automatic translation and expert revision. Translation becomes faster, cheaper, and better! A revision UI will have to look very different to a CAT tool. The most dramatic change is that revision UI has to be extremely simple. To support the current model of augmented translation, CAT tools have become very powerful. However, their complexity can only be handled by a highly demanded group of ten thousands of professional translators globally. For the new workflow a product design is required that can support dozens of millions of, mostly occasional, revisers. Also, the revisers need to be pointed to the texts which need revision. This requires multilingual knowledge. 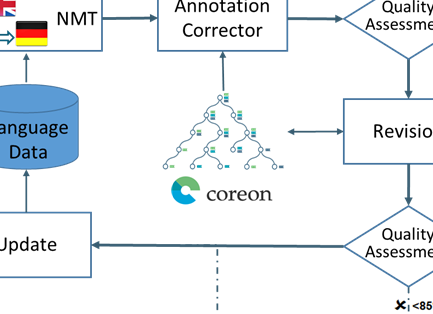 Coreon can answer the two key questions for using NMT in a professional translation workflow: a) which parts of the translated text are not fit-for-purpose and b) why not? To do so the multilingual knowledge system classifies linguistic assets, human resources, QA, and projects in a unified system which is expandable, dynamic, and provides fallback paths. In the future linguists will engineer localization workflows and create multilingual knowledge in Coreon. "Doing words” is left to NMT. The biggest challenge for widespread adoption of the Internet of Things is interoperability. A much-noticed McKinsey report states that achieving interoperability in IoT would unlock an additional 40% of value. This is not surprising since the IoT is in essence about connecting machines devices, and sensors – ideally cross organization, cross industries, and even cross borders. But while technical and syntactic interoperability are pretty much solved, little has been available so far to make sure devices actually understand each other. We would like to share some impressions from recent events and conferences. The interesting common denominator was the following themes: how can we leverage and deploy terminology assets in other business processes? How can we deploy the valuable knowledge in terminology assets to support AI, Machine Learning, Internet of Things, and Industry 4.0? Experts in machine learning and industry consultants gathered in Berlin to discuss and brainstorm about the opportunities Coreon provides for the diverse fields they work in. The Coreon use cases presented were: Cross-border e-commerce, AI expert know-how for knowledge heavy applications, and EU Institutions and interoperability. The event was by personal invitation only and was a huge success. We look forward to repeating it soon! Please click here if you would like to be invited next time. The first trip brought us to Vienna to the Austrian Standards Institute. The ILKR 2017 took place just ahead of the ISO TC37 annual meeting. As its title suggests, ILKR tackles the question how multilingual knowledge resources enable Industry 4.0. Thus many presentations explored the possibilities around multilingual knowledge management, knowledge transfer, and new business models. Our contribution illustrated why the Internet of Things and Industry 4.0 need semantics. When hardware devices speak to each other, they interoperate. This requires a mutual understanding of what they actually do, like “I measure temperature. What do you measure?” The answer is in the semantic of the devices’ metadata. We explained how Multilingual Knowledge Systems (MKS) resolve this challenge and how they facilitate interoperability. And how existing terminologies, taxonomies, and ontologies can be re-purposed to become an MKS. ILKR was followed by a pretty exciting workshop on eCl@ss and Multilingual Product Master Data Management. It had a particular focus on how e-procurement processes benefit from classifications and knowledge systems. Terminologies and other Knowledge Organization Systems (KOS): What is a KOS, what are its benefits, typical examples, the role it plays in the Semantic Web? What is the difference between a classification, a taxonomy, a thesaurus, and an ontology? Coreon is proud to be a regular sponsor of TSS, and we look forward to next year, then again in Vienna (9-13 July 2018). 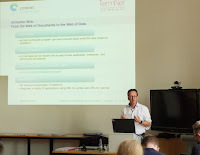 Mid-August we were invited to a one day workshop on touch-points between terminology and ontology data and science. It took place at the HS Karlsruhe, sponsored by DIT, and organized by Petra Drewer, Francois Massion, and Donatella Pulitano. The workshop benefited from a valuable mix of participants: academic researchers from the terminology and ontology world, industry and institutional representatives (SAP, DIN, Deutsche Bahn …), and tool vendors. Its goal was to find commonalities and differences between the two disciplines. As a provider of a unified solution we contributed to the workshop by illustrating how Coreon customers benefit from a fusion of terminology with ontology. Experts confirmed our claim that humanly curated resources, i.e. MKS, are indispensable to make Machine Learning work for less resourced domains and languages. We recommend Petra’s and Francois’ presentation at the upcoming tekom conference on exactly that topic, Wed, 25 Oct, 11:15: Why Artificial Intelligence requires intelligent terminologies (and terminologists)! Meet Jochen Hummel, Coreon CEO and Chairman of the Board of LT Innovate at the event. Do not miss the opening keynote by Marija Gabriel, Commissioner for Digital Economy and Society, and Jochen's panel session "Artificial Intelligence: Hype or Reality?" on Oct 10, 9am. Find us in the large hall C2, booth 2/G04 together with our partner company Semantix. We are proud to present recent highlights, such as brand new filtering capabilities and inline formatting! 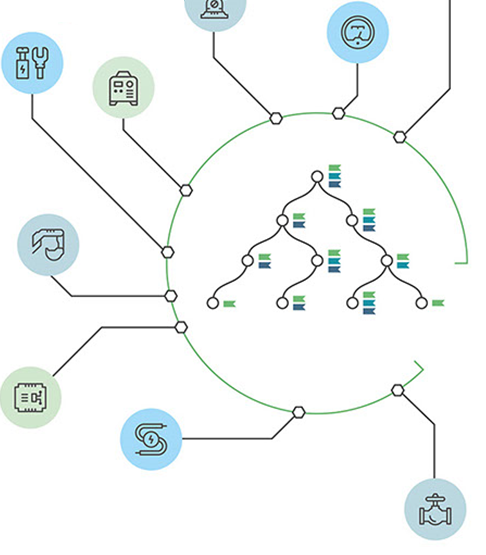 Learn how Multilingual Knowledge Systems boost AI and Machine Learning solutions and how they make the Internet of Things and Industry 4.0 work. Join us for a product demo Tuesday afternoon, 14:45 room C10.1.